Proprietary Name: Allergy Relief What is the Proprietary Name? Non-Proprietary Name: Cetirizine Hcl What is the Non-Proprietary Name? 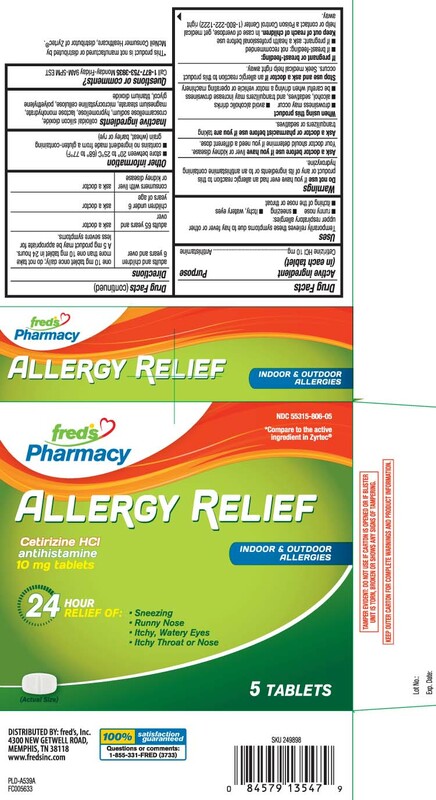 Allergy Relief with NDC 55315-806 is a a human over the counter drug product labeled by Freds Inc. The generic name of Allergy Relief is cetirizine hcl. The product's dosage form is tablet and is administered via oral form. FDA Application Number: ANDA209274 What is the FDA Application Number? Start Marketing Date: 02-28-2019 What is the Start Marketing Date? If you have ever had an allergic reaction to this product or any of its ingredients or to an antihistamine containing hydroxyzine. If breast-feeding: not recommended if pregnant: ask a health professional before use.